Tap into my ready-to-use group discussion topics to stimulate interactivity on your organization’s Facebook page or in your LinkedIn group – all with very little work or time on your part (and at no cost). 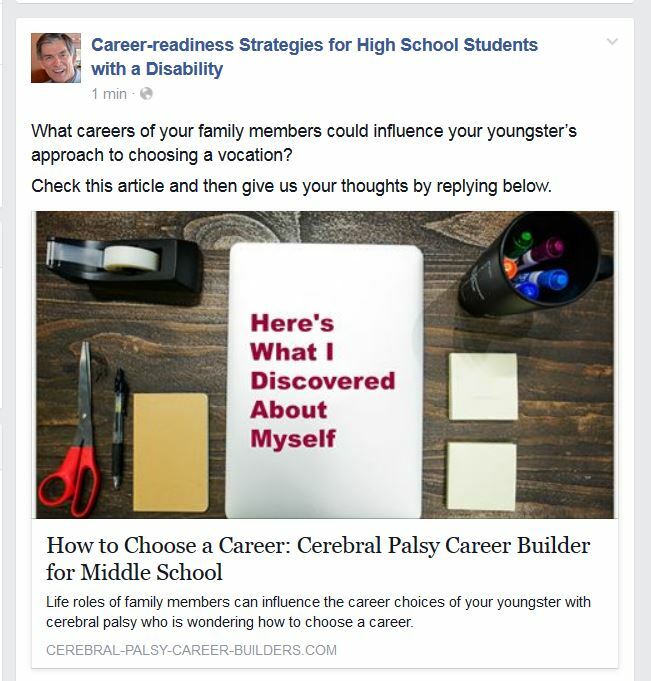 Each topic is backed-up with a quick-but-rich article about a specific career-readiness issue parents often face as they mentor their youngsters with special needs. These topics are divided into five age groups: Elementary, Middle School, High School, College and Job Seeker. Mix or match to meet the needs of your particular community during two months in 2019! 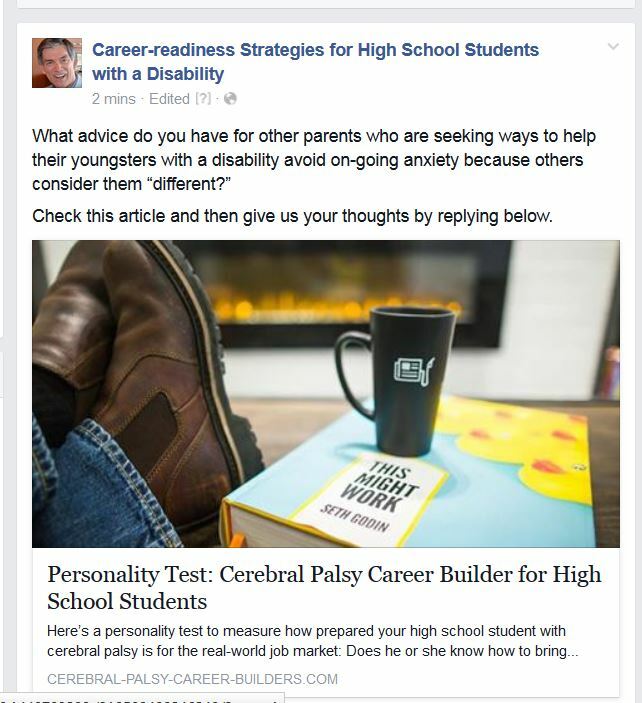 Just copy one of the links below, paste it into your Facebook or LinkedIn group, delete the URL after the photo pops up and then paste the discussion question you've chosen to accompany the entry. TIP: To start your discussion, add this line: "Check this article and then give us your thoughts by replying below." Contact me a couple of days in advance of your scheduled discussion, and I'll kick off your discussion by submitting a comment of my own on your Facebook or LinkedIn group. Remember, each topic you post will appear under your organization's own identity. The graphic for each article (see below) will pop up automatically as you complete your posting. What situations tend to trigger feelings of insecurity in your child? 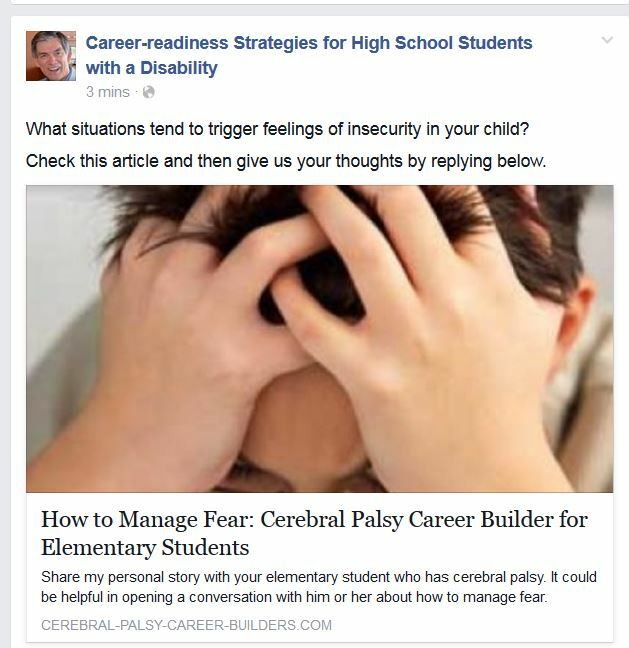 What ways have you found work best in helping your child express his or her feelings of insecurity? How have you seen success and recognition for that success change your child’s emotional well-being? Sample Facebook entry from the Week 1 link above, using the first of the three potential discussion questions. Within your family, how do you, as a parent, show your youngster that it’s sometimes good to give help to others instead of always feeling entitled to receive help from others? What simple tasks have you found effective in developing a “giving mode” in your child? What materials/counseling/resources have you discovered that have helped you effectively avoid “learned helplessness” in your child? Sample Facebook entry from the Week 2 above, using the second of the three potential discussion questions. How has your youngster developed the motivation to work hard at precisely the things he or she needs to improve? Are there steps you can take as a parent to develop motivation in your youngster? How do birth order and sibling rivalry influence the development of motivation in a youngster with a disability? Sample Facebook entry from Week 3 above, using the first of the three potential discussion questions. Who within your own family had the most influence on the vocation you have pursued? What careers of your family members could influence your youngster’s approach to choosing a vocation? How do you think your own vocation can influence your youngster’s future career path? Sample Facebook entry from Week 4 above, using the second of the three potential discussion questions. How do you handle the anxiety others normally feel when they meet you and your youngster for the first time? As a parent, how have you helped your youngster acquire the ability to calm down quickly after a stressful incident due largely to his or her disability? Sample Facebook entry from Week 5 above, using the third of the three potential discussion questions. How do you help your youngster to keep trying (and always be positive) when he or she is getting no response or outright rejection by employers for part-time employment during the summer months? 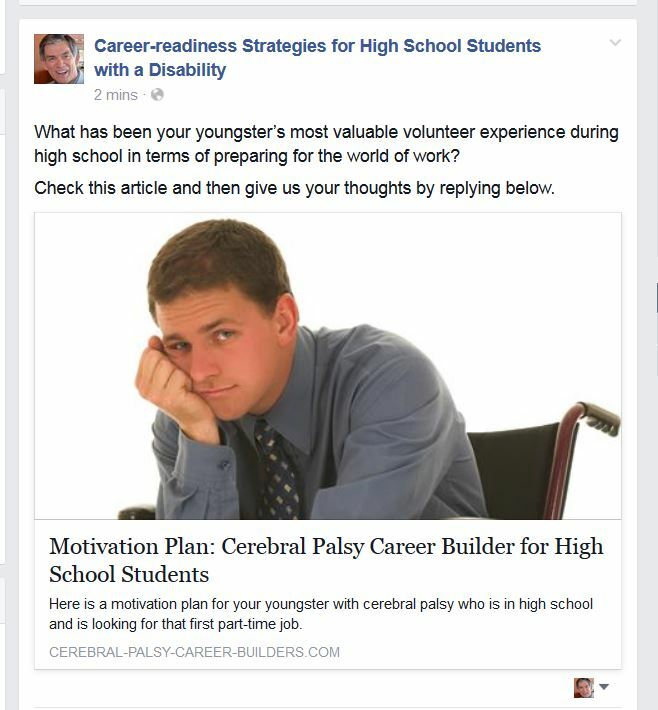 How has your youngster with a disability gained a vocation-minded mentor outside of your family? What has been your youngster’s most valuable volunteer experience during high school in terms of preparing for the world of work? Sample Facebook entry from the Week 6 link above, using the third of the three potential discussion questions. What steps does your college son or daughter need to take now to become a job candidate who is “qualified” in the eyes of employers? 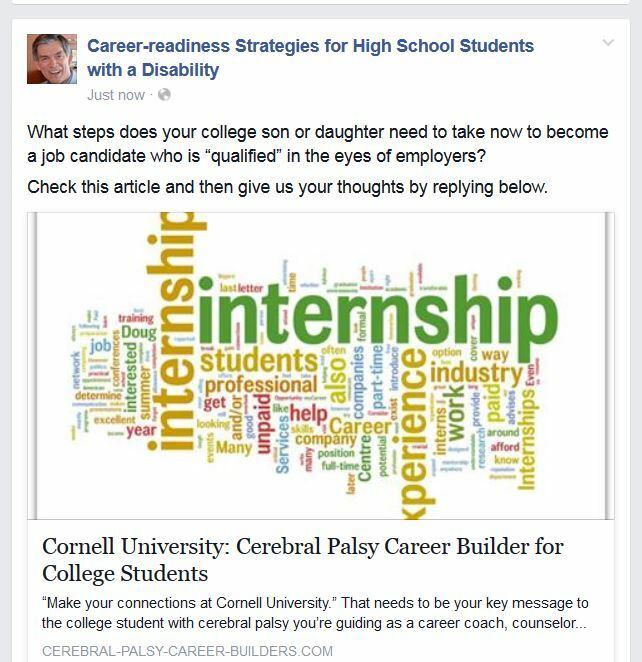 What strategies has your college student with a disability employed to make sure he or she is included in campus interviews conducted by prospective employers? 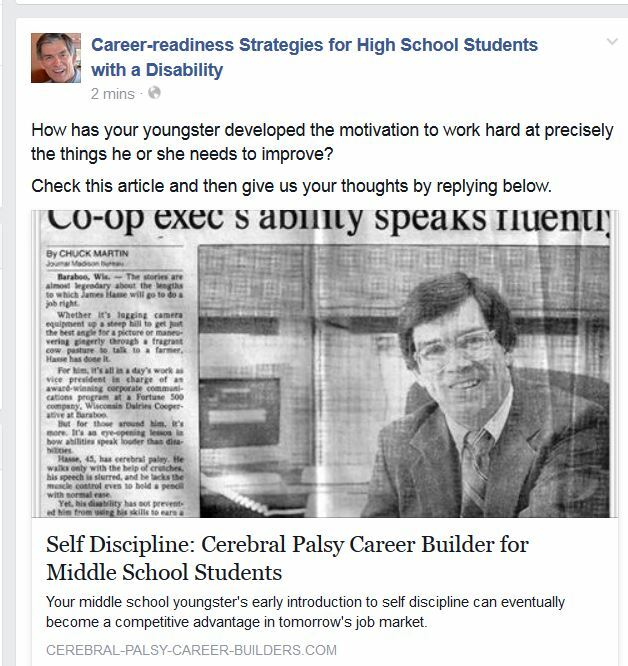 In your experience, what works the best in helping your college student with a disability develop effective oral and written communication? Sample Facebook entry from the Week 7 link above, using the first of the three potential discussion questions. What steps has your young job seeker taken to become “adaptive technology” independent? 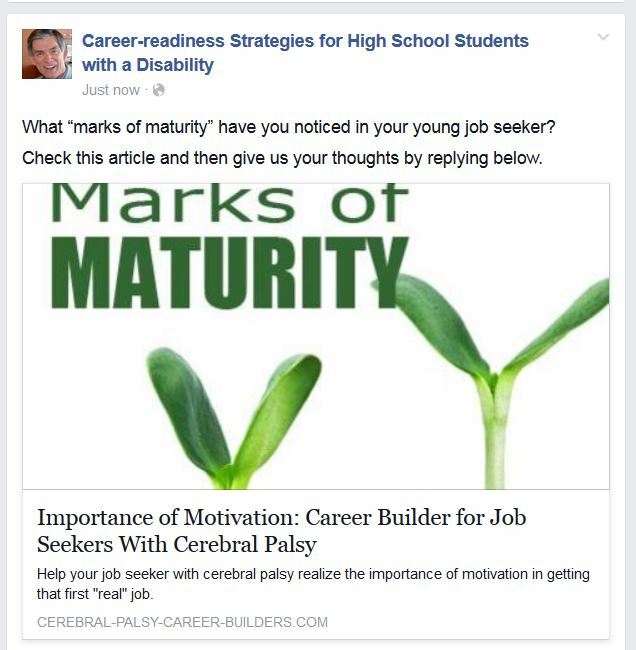 What “marks of maturity” have you noticed in your young job seeker? What would you like to see your young job seeker say or do that would indicate that he or she is on the way to independent living? Sample Facebook entry from the Week 8 link above, using the second of the three potential discussion questions. 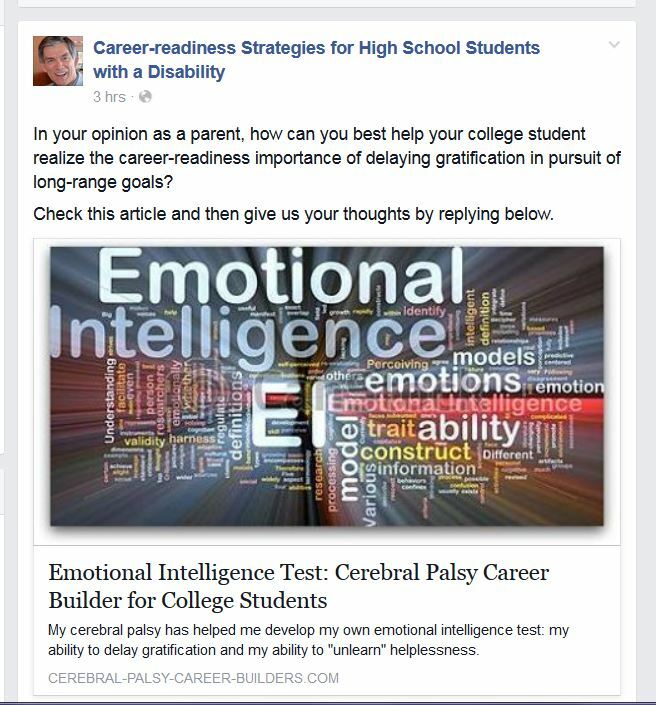 What important tip involving emotional intelligence would you like to get across to your college student with a disability? In your opinion as a parent, how can you best help your college student realize the career-readiness importance of delaying gratification in pursuit of long-range goals? Sample Facebook entry from the Week 9 link above, using the third of the three potential discussion questions. What is your son or daughter’s prime passion, a situation in which he or she is most comfortable, authentic and likable? The answer to that question is a big step toward building a personal brand and landing a job. 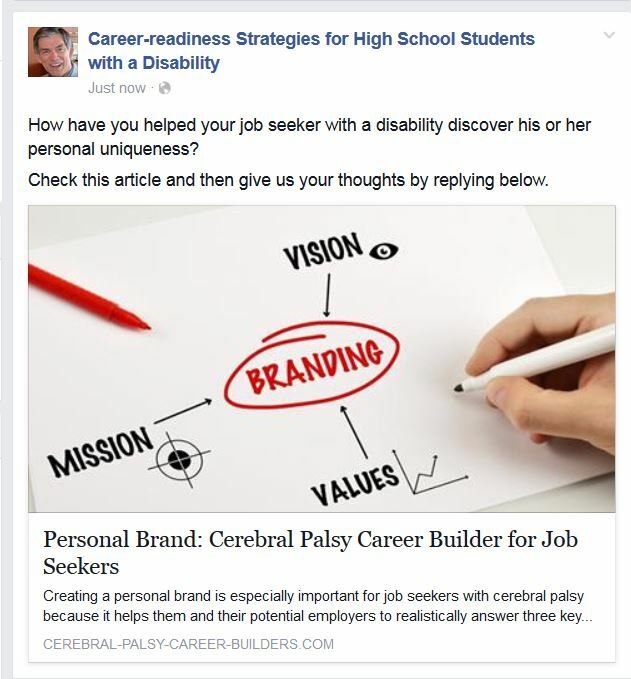 How have you helped your job seeker with a disability discover his or her personal uniqueness? As a parent how can you help your young job seeker be realistic about the job prospects that really offer avenues for reaching one’s full potential without putting a damper on motivation and enthusiasm? 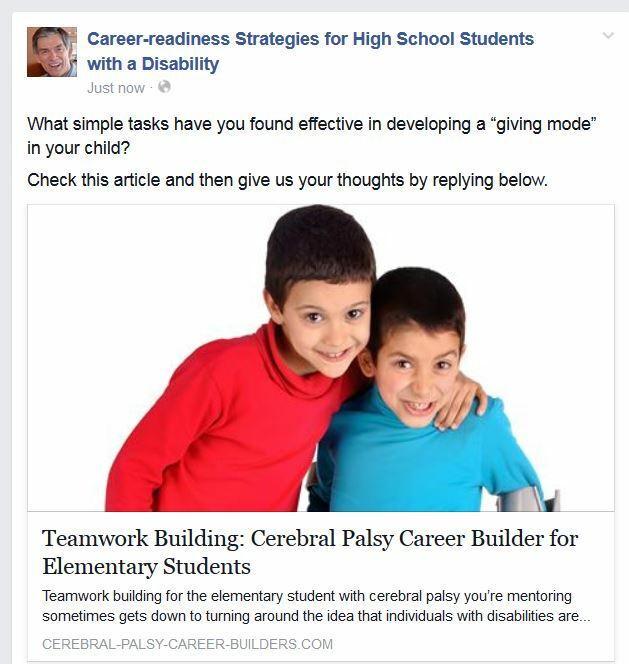 Sample Facebook entry from the Week 10 link above, using the second of the three potential discussion questions.